Posted: Sunday, June 3, 2018. 2:48 pm CST. By BBN Staff: A Peruvian fishing vessel flying a Belize flag, named the Damanzaihao described as the world’s largest fish factory vessel in the world, was seized by that country’s Ministry of Environment last Friday for reported acts of Illegal, Unreported and Unregulated (IUU) fishing. The vessel, which is capable of processing approximately 547,000 tons of fish per year, faced multi-million dollar penalties in 2016 for proven IUU violations. 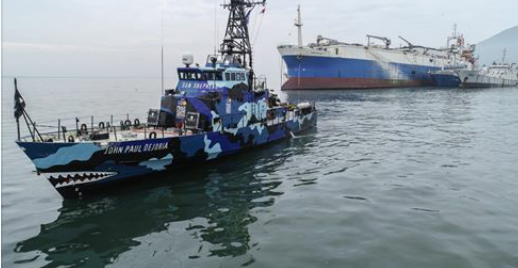 The ship requested permission to leave port from Peru twice this past week, however, Sea Shepherd, a non-profit marine conservation group had written to the Peruvian government imploring it to take measures against the vessel which is accused of marine pollution in addition to IUU violations. The Damanzaihao switched from the Peruvian to the Belizean flag, presumably in an attempt to avoid penalties in that jurisdiction, however, authorities proceeded with their investigation. Under the Penal Code of Peru, successful convictions carry a penalty of three to five years of incarceration. Sea Shepherd applauded Peru’s efforts to bring an end to the extensive over-exploitation of the oceans. Sea Shepherd also noted that Belize had been previously “red carded” by the European Commission for lacking in commitment to tackle (IUU) Fishing. It added that although the country’s red card was lifted, Belize must swiftly refrain from flagging the Damanzaihao and allowing it to “continue destroying marine ecosystems across the planet”. In 2014, Belize became the first of three countries who were removed from the list of non-cooperating countries by the European Commission. The decision was made after a recommendation by the Directorate General for Maritime Affairs and Fisheries to remove Belize from this list in consideration of the concrete measures taken by the country to rectify the deficiencies pointed out by the European Commission.